There's a question that needs to be answered. That question is "“How can the digital world help people with disabilities lead more fulfilling lives?” Together Erin Rapacki of Suitable Tech and Henry Evans, a Technology Activist living with quadriplegia, will come together to discuss the ultimate answer as well as the idea that technology often aims only to improve basic needs, but not overall well-being and quality of life for the people living with disabilities. 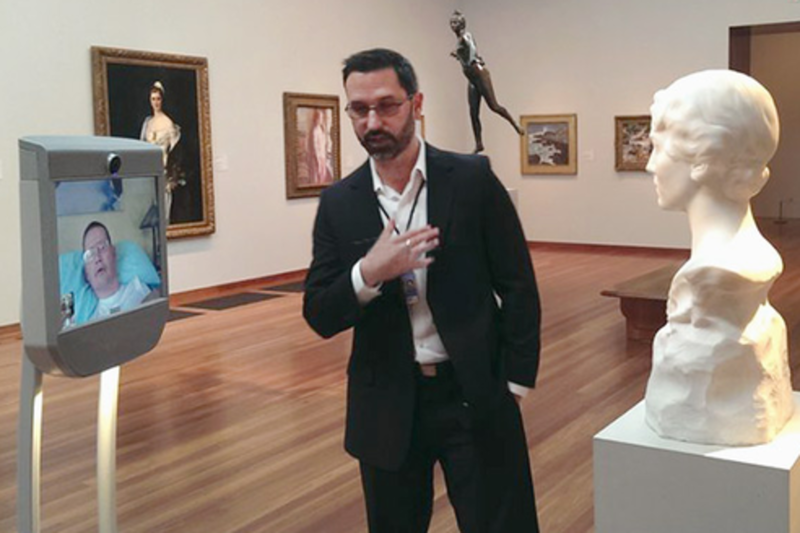 Via the Beam Smart Presence System, Henry will talk about how beaming into museums has allowed he and others who are home-bound with disabilities to visit places which would be otherwise impossible for them to travel to. Join Henry and Erin as they take audience on a live tour of museums, and other locations, around the world. Erin a product storyteller with robotics experience across academia and industry, from both the Boston and Silicon Valley hotspots, with projects ranging from flexible logistics, supply chain, FDA approval, consumer products, military casualty extraction, assistive devices, Smart Presence (formerly known as "robotic telepresence"), and warehousing. Erin is now Director of Marketing at Suitable Technologies. Suitable Technologies develops Smart Presence Systems (SPS) ideal for bringing people together. The Beam SPS, which includes products BeamPro and Beam+, is an immersive communication experience that projects a person's authentic presence better than any other video conferencing device on the market today. Beam enables people to be there, and interact naturally by seeing and being seen, and hearing and being heard, from anywhere in the world. At age 40, Henry Evans was left mute and quadriplegic after a stroke-like attack caused by a hidden birth defect. Years of therapy helped him learn to move his head and use a finger -- which allows him to use a head-tracking device to communicate with a computer using experimental interfaces. Today, he's a pioneer in adaptive technology to help him, and other disabled people like him, navigate and explore the world.